I decided that I wanted to do an Engineering project, where the kids BUILD a car that rolls. Criteria: Our students range in age from 3 – 7. I was looking for a project that our 5 – 7 year olds could do independently, with assistance with perhaps just a couple quick tasks. I expected our 3 and 4 year olds would need a fair amount of help from their parents or a teacher. The materials need to be affordable. As a non-profit that tries to keep our tuition low, it’s something I keep in mind. We do like to use items from the recycle bin when possible, but we also have to consider whether we can get enough of them for 28 kids to do a project. (So, when we’re talking wheels for cars, that means 112 items!) It couldn’t involve a crazy amount of prep work for my co-teacher and I. (So, not cutting out 112 circles…) And it had to produce a fun and usable product that was not too delicate to be played with. Almost Unschoolers – Body: clothespin; axle and wheel: Straw casing, bread tie and button wheels. Assemble: run bread tie through straw, loop bread tie through holes in buttons or the loop on the back of the buttons; Clip clothespin over one straw, slide the other straw in the back, add tape so it can’t slip out. My thoughts: minimal prep, looks doable for little ones… would buttons roll well? Could I sub pipe cleaner for bread tie? Price of buttons?? Price of clothespins? Nerdy Science – Body: TP tube. 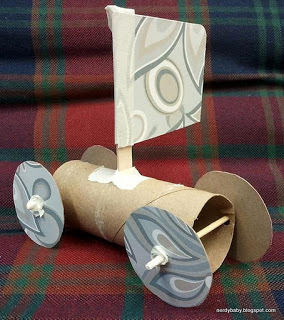 Axle and wheel: BBQ skewer and circles cut from cardboard (kleenex box). Assembly: holepunch the TP tube and wheels. Run skewer through, tape wheels in place on the skewer. (Optional: add sail). My thoughts: easy to assemble, cheap materials. Lots of prep time cutting circles. Not very durable for playing with, and how well do wheels roll? Guessing it won’t roll down a ramp on its own. RAFT – Car on a Roll. Body: corrugated plastic or cardboard. W&A: Straw casing, coffee stirrer, foam wheels. Assemble: tape straws on, run coffee stirrer through straw, mount foam wheels. Thoughts: Easy! Where do I get foam wheels?? RAFT – Cart the Box. Body: cardboard box or lid (width needs to be less than skewer length). Axles: bamboo skewers, wheels: CDs; Assembly – glue foam blocks over holes in CD. Put skewers through box, then through straw spacers, then into the foam blocks in the CD. Thoughts: need to collect boxes / lid; prep foam blocks (or other wheel hub), buy lots of CD’s; side benefit – box can carry a load. RAFT – Fender Bender Boxcars. Body – use a rectangle of stiff paper, make four cuts, bend flaps up and tape to make a box. Wheel and axles: tape straws on bottom, thread smaller straws through them, attach to plastic wheels. Thoughts: Easy. flimsy?? What to use for wheels…. 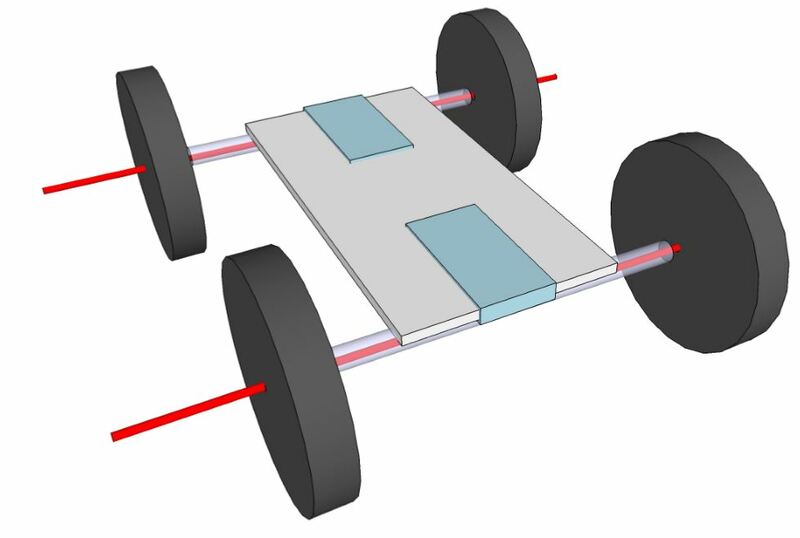 RAFT – Retractor Car. Body – Corrugated cardboard. Axles – bamboo skewers run through the channels in the corrugated cardboard, with wire nuts / plastic cones. Wheels – plastic or paper cup lids with foam circle hubs. Assembly: Run skewers through cardboard channels. Cap off each skewer with a wire nut. Poke holes in foam circles, stick to lids, mount on skewers. Thoughts: source for lids? for foam circles? Cost of wire nuts? (Can be motorized with retractable badge.) RAFT sells kits for these – $30 for supplies for 10 cars: http://www.raftstore.net/educational-kits/retractor-car. A couple other ideas – the sources didn’t have pictures…. Could order wooden wheels and 1/4 dowels from Amazon. Easy! But not materials parents would have easy access to at home, plus cost ~ $1.60 per car. 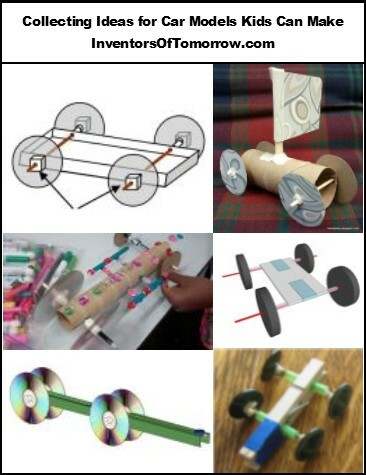 Options for Car Body = clothespin, TP roll, paper towel roll, flat piece of cardboard / foam core / corrugated plastic; box, or paper folded into box. I knew I wanted to build a car that was capable of using a retractable badge clip for a motor, so I needed a sturdy body to withstand that. Options for Wheels = buttons, paper circles (lots of prep! ), CD’s (where to get, plus challenge of making hole smaller to mount on a skewer or dowel), wooden wheels, foam circles (where to get other than with RAFT kits? ), cup lids, bottle lids, spools, bobbins. Again, if I wanted to motorize the car, I’d need wheels with traction. And, I needed minimal prep time. Axles = bread tie inside straw, pipe cleaner inside straw, BBQ skewer through holes in toilet paper tube or box, skewer through straw, dowel, coffee stirrer in straw, run skewer or dowel through the channels in corrugated plastic or cardboard. Note: I tested pipe cleaner axles, and I found that every time I tried to bend them to attach to a wheel, it would bend the center section and they wouldn’t roll smoothly. 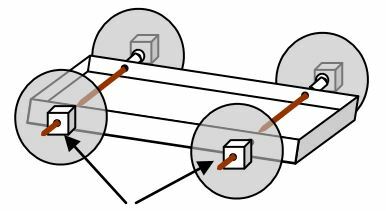 “Motors” – mousetrap, retractable badge, mechanism from pull-back car, rubber bands. Start with the Nerdy Science idea: kids decorate TP tubes, you punch four holes in each, run skewers through, then you mount on cardboard circles. (If you’re lucky, you have a die cut machine to prep these!) Not terribly durable, but easy and cheap. 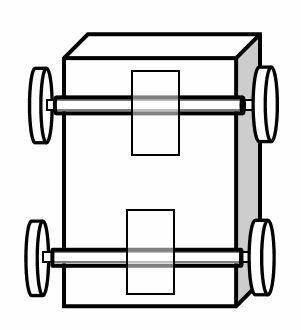 Use small boxes for the bodies (or fold your own like Fender Bender boxcars), tape straws to the bottom to serve as “bearings” for the axles. Use smaller straws or skewers for the axles. Attach to buttons or cardboard circles. I wanted to be able to motorize our cars, so neither of these options was sturdy enough for me. I did lots of testing, revising, re-building… tinkering… I ended up with two options I’m considering for this weekend’s class. Using a clothespin body like Almost Unschoolers. Dismembering a pullback car to use for the wheels, axles, and motor. Tutorial here. 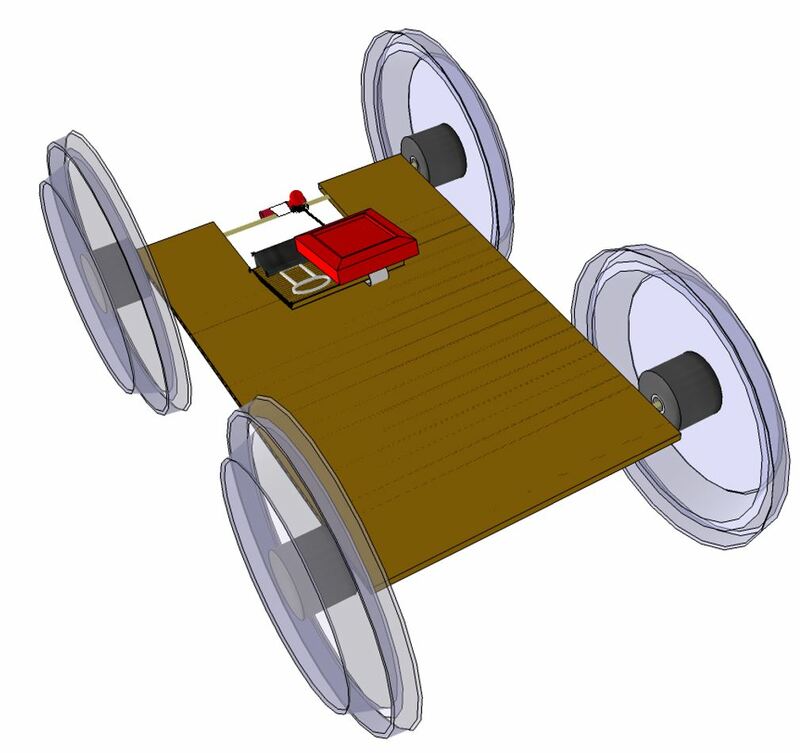 A design inspired by several of the RAFT ideas: I’m using corrugated plastic for the body (cardboard would also work), straws for bearings, dowels for axles, and wooden wheels. We’ll motorize it with a retractable badge holder. Tutorial here. 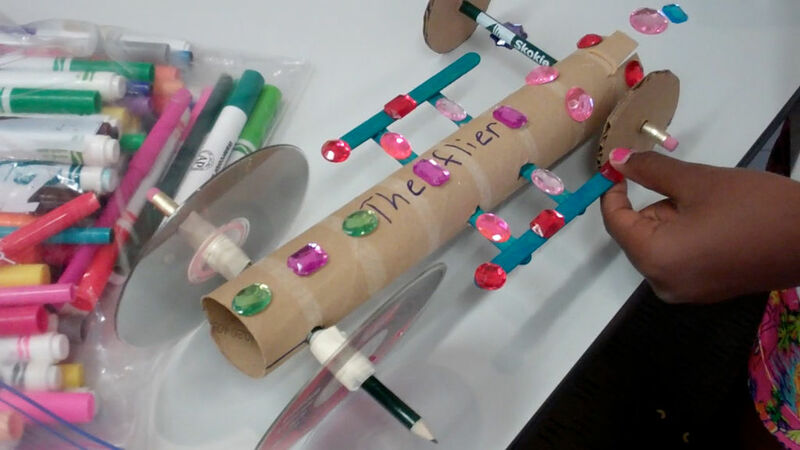 Tinkering Method You could also do this as a pure tinkering activity – on a table, put one bin full of options for car bodies, a bin full of options for wheels, another container with possible axles, and let the all be creative, building cars from scratch. Once the kids have build their cars, set up a test track… a nice long ramp and measuring tape so they can measure how far their car travels. After testing, you may need to “tinker” – adjust variables to help the cars roll better. Really lightweight cars often don’t roll well. Adding a little weight can help. Depending on your design, you could place weights in your car (like pennies, glass blobs, washers…), tape or glue them on, or clip on big binder clips or paper clips. What’s your favorite car design for kids?